Some times the symbol is called yin and yang, the supreme ultimate and the great polarity. The two opposite forces that make up one whole, with a seed of each others energy inside (the two little circles that are inside the two halves). The larger circle which contains the two energy is the un-carved block ( the void). So there is five symbols in the one the un-carved block ( the big circle that contains yin and yang) the two energies yin and yang (opposite energies, black white, dark, light etc) and the two seeds inside yin and yang which symbolizes that each opposite energy contains with in itself a seed of the opposing energy. Together this make one whole, Tai chi. The tai chi symbol is the embodiment of the taoist teachings of the great polarity of the universe and all that is contained within it "all the myriad Things" as Lao Tze puts it in one of the great taoist books the Tao Teh Ching. 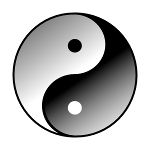 The yin and yang, explains the belief in polarity that taoist's have. which is that, everything that is contained with in the universe has an opposite and the two opposites together make a whole, as one half can not survive without the other. There is no hot without cold, their is no happy without sad, their is no life without tai chi Death, and so on. "When all the world recognizes beauty as beauty, this in itself is ugliness. Therefore, the sage manages affairs without ado, And spreads his teaching without talking. He accomplishes his task, but does not swell upon it. That nobody can ever take it away from him." The Tai Chi symbol has the name tai chi which sometimes has the translation as supreme ultimate.This in its self is alright as yin and yang is the supreme ultimate to the Taoist. This is a popular translation in Tai Chi chuan circles and of course the word chuan means boxing so "tai chi chuan" would then mean supreme ultimate boxing. This of would not be taken very well by the taoist community, as to say that one style of boxing is supreme over another would be considered inferior in itself to a taoist that believe. Far better were it to stop in time! And the edge cannot be preserved for long. And it can no longer be guarded. And you will only reap a crop of calamities. When you have done your work, retire! Tai chi symbol, some say, maybe a better translated as great polarity in reference to tai chi chuan. This would then make tai chi chuan translate to Great Polarity boxing. This translation maybe a more accurate descripton of the tai chi symbol as it relates to tai chi, as tai chi chuan is based on the taoist concept of the soft overcoming the hard, turn left to go right, go down to come up and so on and so forth. The execution of relaxed actions to create a state of softness, which then accumulated produce a state of firmness, which in turn compliment each other and you have the end result of the balance between the softness and the firmness or the ultimate state of being. The tai chi symbol embodies this concept. With this translation, (the great polarity), the tai chi exponent can then practice Tai chi with out setting store by his/her riches and honor, and in such a way he/she will not reap the crop of calamities, that Lao Tzu speaks of. The tai chi symbol relates to tai chi through the movments and tai chi postures.